ACC - Antarctic Circumpolar Current, which advects a large volume water mass of warm water just below the surface layer known as Upper Circumpolar Deep Water (UCDW). This water mass supplies heat across the continental shelf. The heat from this water mass and its underlying Lower Circumpolar Deep Water (LCDW) travels across the continental shelf via deep canyons, serving as conduits to the coastline where it can reach the underside of the ice shelves/ice sheets, contributing to their melt and raising sea level. AIS - Antarctic Ice Sheets. albedo - How reflective a surface is. High albedo means that much of the incoming radiation is reflected (for example snow and ice); low albedo means that much of the incoming radiation is absorbed (for example water). Albedo Flip - "Albedo flip" is a term that describes the process by which a former heat-reflecting ice surface will become a heat-absorbing body of water. AR3, AR4, AR5 - IPCC Assessment Reports 3, 4 and 5, respectively. Antarctic Bottom Water - The coldest and densest water mass in the global oceans. Formed in particular places on the Antarctic continental shelf such as Weddell Sea and Ross Sea when surface water cools and becomes more dense and so sinks to the ocean floor. Once formed it tends to flow northwards hugging the seafloor. It can be traced into many ocean basins, including parts of the North Atlantic Ocean. Antarctic Circumpolar Trough - An atmospheric feature located between 60°S and 65°S. A zone of low pressure that causes variable winds moving from west to east and responsible for the "Screaming sixties" as known to seamen. Antarctic Convergence (Polar Front) - A surface boundary where which the colder, north flowing Antarctic Surface Waters sink beneath warmer circulating waters. This marks a change in the oceans surface temperature and also chemical composition. North of the convergence, the area is known as the sub-Antarctic. calve - The formation of an iceberg from a glacier. Once the ice flowing from a glacier reaches a body of water it begins to float and may crack at the "hinge zone", once free of the glacier a piece of ice becomes an iceberg and the glacier has calved. continental shelf - The region in the ocean around a continent between the shoreline and the continental slope. An area of shallow water where the depth is usually less than 200 meters (650 feet). In Antarctica however, the continental shelf averages 500 meters in depth (1640 feet)! The continental shelf has formed by slow deposition of sediment eroded from the continent and has a gentle slope (around 1°). continental slope - Narrow, steep (3° to 6° slope) transition zone between the shallow shelf and the deep ocean floor. Coriolis effect - moving objects appear to deflect from their anticipated straight-line course. Coriolis effect is a result of the rotation Earth (and an observer's position on it). Responsible for the fact that water spirals down a plug-hole rather than going straight and the direction is different in each hemisphere. Only at the equator does water go straight down. crevasse - A deep, usually vertical, crack or split in a glacier, occurs as a result of the brittle ice flowing over a uneven surface beneath the ice. Crevasses can easily become covered by blown snow, even very wide ones. Great care must be taken when crossing ice and snow fields to avoid them. cryosphere - That portion of Earth's surface that is permanently frozen through the year. downwelling - In oceanography, the replacement of deep waters by surface waters moving down because of a change in temperature or more rarely salinity. Downwelling may bring waters rich in oxygen to the deeper parts of the ocean or lake. draft - The distance below the water level (sea level) the bottom of an iceberg reaches. In some cases, icebergs are blown into shallow waters by storms and the bottom ploughs into the ocean causing the iceberg to get stuck. Draft also refers to how far below the water line the keel of a ship reaches and so determines how close into shore the ship can go. East Wind Drift (Antarctic Coastal Current) - Westward flowing ocean surface current that flows anti-clockwise around Antarctica, driven by the polar easterlies. easterlies - Winds that blow from the east. The polar easterlies blow close to the continent and help move the ocean surface currents known as the east wind drift. evaporation - Change in state from a liquid or a solid to a gas. Evaporation takes place most quickly in an arid or dry environment when there is little or no water vapor in the air. Antarctica is arid and solid ice can "evaporate" or turn into a gas, particularly if a (relatively) warm wind blows across a snow or ice field. The change from a solid directly to a gas is properly called sublimation - like the "smoke" you get when you open the freezer door. extraordinary Katabatic wind - Katabatic wind that is particularly long-lasting (days to even weeks) and remains fairly constant in strength during that time. fast ice - Sea ice that forms in situ along the coastline and remains attached. firn - A transitional stage between snow and glacial ice, a type of snow that has survived a summer melting season and has become more compact than freshly falling snow. fissure - A long, very deep, narrow opening, sometimes used instead of crevasse. fjord (fiord) - A long, narrow, steep-walled, u-shaped coastal inlet. Fjords typically have been excavated by glaciers. frazil ice - Ice crystals in the water column, usually near the water surface. Frazil ice crystals are not oriented in an organized manner, and have the appearance of slush or separated needles, diving through frazil ice you can see that below the main body, the crystals are quite large and separate. The first stage in the formation of sea ice. frost smoke - Condensed water vapor that forms as a mist above any open sea water in very cold weather. gale - A strong wind. On the Beaufort Scale - used to gauge the speed of the wind, a gale has winds of 39 to 46 miles per hour (62 to 74 kilometres per hour). Gales are common in Antarctica. GCM - General Circulation or Global Coupled Model. geomagnetic pole - If the Earth's molten metallic core is imagined to be a giant bar magnet, the Geomagnetic Pole is where you would expect the magnetic field lines to converge. But ocean currents, mountains and solar activity mess things up, similar to how a compass can be confused if you hold it near something metal. Because of this while the geomagnetic pole is where the needle of a compass should point straight downwards, it is the magnetic pole where this is actually the case. The Magnetic Pole can move many kilometres in a day, whereas the Geomagnetic Pole moves much more slowly. The geomagnetic poles aren't fixed and wander about, currently the south geomagnetic pole is about 1160 kilometres (725 miles) north of the south geographic pole. geothermal - Geo - earth, thermal - heat. Heat generated within the interior of Earth. Visible indications of geothermal activity are geysers when underground water comes into contact with a heat source, such as hot rocks near a volcano. In Antarctica, Deception Island is geothermally active, there are also thought to be several regions on the continent where glaciers are melted from below by geothermal heat making them flow more quickly at those regions. glacial erosion - The wearing down of the Earth's surface by glaciers. Rock debris at the bottom of a glacier scrapes and erodes the surface over which the glacier flows like a giant hugely heavy piece of sand paper. glaciation - The formation, activity, and retreat of glaciers through time. The glaciation of a region refers to the growth of ice over that region. Large parts of the Northern Hemisphere experienced glaciation in the past - ice ages. glacier - A river of ice. Usually a mixture of ice, air, water, and rock debris formed at least partially on land. They are large enough for the ice to flow with gravity. Glaciers can be small valley glaciers, ice streams, ice caps, and ice sheets. The term glacier also includes ice shelves if they are fed by glaciers. Freshwater. grounding line - The point a glacier that is flowing into a sea or lake loses contact with seafloor and begins to float as an ice shelf. Heat reservoir - Places where heat is absorbed and then distributed slowly to the surroundings. Oceans and other large bodies of water act as heat reservoirs. They absorb heat and slowly pass it to the atmosphere. This is one reason why coastal areas and islands never get as cold as areas inland in winter. The heat doesn't have to be very great, the sea can still seem very cold, as long as it is above the surrounding air temperature, heat will be transferred. ice cap - A large dome-shaped mass of ice that is thick enough to cover all the landscape beneath it so appearing as a smooth coating of ice. Ice caps are smaller than ice sheets, usually under 50,000 square kilometres (19,000 square miles). Ice caps can deform and flow with gravity and spread outward in all directions. Freshwater. ice sheet - A large mass of ice that is thick enough to cover the landscape beneath it so appearing as a smooth coating of ice. Ice sheets can deform and move with gravity, they are larger than ice caps. Ice sheets cover much of Greenland and Antarctica. Freshwater. ice shelf - A large flat-topped sheet of ice that is attached to land along one side and floats in the sea or a lake. Formed where a glacier or ice shelf has reached the water and kept flowing, it is fed from the landward side and eroded from the seaward side by the calving of icebergs and melting. Freshwater. ice stream - A rapidly moving current of ice in an ice sheet or ice cap. Ice streams flow more quickly than the surrounding ice and remove ice from the ice sheet. Antarctic ice streams may flow about one kilometre per year (0.6 miles per year). Freshwater. ice tongue - A long, narrow, projection of ice out from the coastline, similar in origin to an ice shelf, but usually formed where a valley glacier flows rapidly to the sea or a lake. Freshwater. iceberg - A large piece of floating ice that has calved, or broken off, a glacier or ice shelf. Icebergs occur in lakes and the ocean and can be vast, the size of islands or small countries. Freshwater. katabatic winds - Wind that results from dense, cold air flowing down a slope by gravity. Over Antarctica, air cools over the high plateau region and flows towards the coast, by the time it gets to the coast it can have reached extreme speeds and blow continuously for weeks. land-based ice sheet - a large body of ice with a base mostly above sea level. The East Antarctic Ice Sheet is a land-based ice sheet. Freshwater. lapse rate - The change in temperature associated with a change in elevation. When climbing a mountain, the temperature falls approximately 1°C for every 100m in altitude gained. latitude - Imaginary lines that allow for the measurement of position north or south of the equator. Latitude is measured in degrees (one degree - 60 nautical miles, or 111 kilometres). The equator is at a latitude of 0° and the poles lie at latitudes of 90° north (North Pole) or 90° south (South Pole). Lines of latitude differ in length according to how far north and south they are. lead - Long, narrow opening or fracture in sea ice. Leads can be useful to shipping because they do not have to waste fuel and time by breaking ice, they can be disastrous if travelling over sea-ice as the path is no longer there. Leads are also useful to seals and whales that can use them to breathe and for birds that can feed on marine prey through the lead. longitude - Imaginary lines that wrap around the Earth intersecting at the north and south geographic poles. Lines of longitude are numbered from 0° (the Greenwich Meridian, passing through Greenwich in London, England) to 180°. Longitudes are called east if they fall east of the Greenwich Meridian, and west if they fall west of the Greenwich Meridian. Lines of longitude are all of the same length. maritime - Bordering or next to the ocean or sea. Maritime climates are oceanic climates, and are milder than the inland climates because of the moderating influence of the sea which acts as a huge heat sink absorbing heat in the summer and giving it out in the winter. Polar Front (Antarctic Convergence) - A surface boundary where which the colder, north flowing Antarctic Surface Waters sink beneath warmer circulating waters. This marks a change in the oceans surface temperature and also chemical composition. North of the convergence, the area is known as the sub-Antarctic. Polar Plateau - The relatively flat, high altitude central region of the East Antarctic Ice Sheet. The plateau has an average height of 2000 meters (about one mile) above sea level and a smooth surface with a small slope towards the coast in all directions. polynyas - A polynya is an area of open water in pack ice or sea ice, they may be kept open by constant winds or the upwelling of water and so tend to recur in the same locations year after year. precipitation - Rain, snow, hail, sleet etc. moisture falling from clouds to the surface of the Earth, usually as rain, snow, and ice. The amount of precipitation is always measured as water or rain equivalent so allowing for the fact that snow can have various structures and densities. reflectivity - The amount of light or energy that bounces off a surface relative to the amount of light or energy that reached the surface. A mirror is an example of an object with high reflectivity. The ocean has low reflectivity. Reflectivity may also be called albedo. salinity - The amount of dissolved salts contained in sea water. The average salinity of sea water is 35 parts per thousand, but can vary with location. sea ice - A general term for any ice that forms from frozen seawater. Sea ice covers large parts of polar waters in the winter and melts back each summer. South geographic pole - 90°S. The south geographic pole is the southern location where the axis of rotation of Earth intersects Earth's surface. South geomagnetic pole - The point on Earth's surface in the Southern Hemisphere where the axis of the Earth's magnetic pole intersects. The south geomagnetic pole is approximately 1160 kilometres (725 miles) north of the south geographic pole (think about it). The south geomagnetic pole is tilted about 12 degrees to the axis of rotation of the Earth (geographic pole). South magnetic pole - the point on Earth's surface that a south-seeking compass needle seeks. At the South magnetic pole a compass needle will point vertically downwards. This point is currently off the coast of Wilkes Land and wanders around. stratosphere - The layer of the atmosphere that is above the troposphere, it extends from approximately 10 to 50 kilometres (6 to 31 miles) above Earth's surface. The upper region contains the ozone layer. subglacial - Underneath the glacier. supercooled - A condition when water is still liquid even though it is at a temperature at which it normally would freeze. Often under these conditions a small physical movement a small knock or tap will cause the water to freeze almost immediately. tabular iceberg- A flat-topped iceberg, like a table. Freshwater. tide crack - Any crack in sea ice that is caused by the rise and fall of the tide. As the tide rises so the area of the sea increases and a crack forms, as the tide falls, so the area decreases and the crack closes. Often form around offshore rocks, between the shore and sea-ice, around grounded ice bergs or even stretching for miles between islands. tongue - A mass of ice projecting from a glacier into the sea. It is still fixed to and forms a part of the larger glacier. freshwater. trade winds - One of three major circulation cells in both the northern and southern hemispheres. The trade winds from approximately 0° to 30° north or south latitude. Within the regions of the trade winds, prevailing winds blow toward the west. They were given their name as in the days of sailing ships, they aided the progress of the ships and hence the trade of goods carried by those ships. upwelling - An oceanographic term, the rising of deeper waters to replace surface waters. Upwelling often brings waters rich in nutrients to the surface, resulting in a region where ocean productivity is high. West Wind Drift (Antarctic Circumpolar Current) - A Southern Ocean surface current flowing east and driven by westerly winds. The West Wind Drift carries a large volume of water and it is a strong current because no continents are in the way of the flow path. 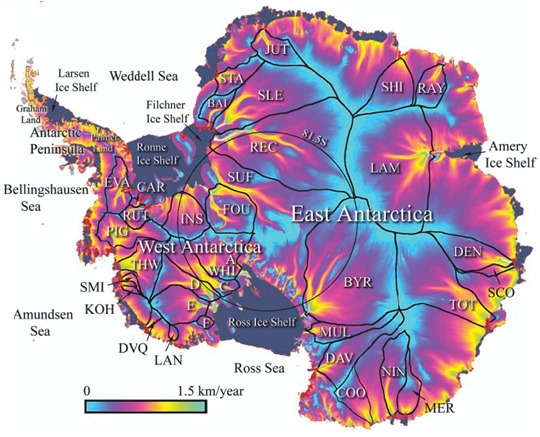 WAIS - West Antarctic Ice Sheet (the last marine ice sheet in the world). WCRP - UN, WCRP Task Group on Sea Level Variability and Change. Thanks, ASLR. To TPTB, can you please make this sticky? Edit: added graphic (linked from here) identifies glaciers. At least some of the abbreviations are identified in ASLR's Glossary. Also shown is a (cross-posted) map of Antarctica showing the major ice shelves.